The intervention starts on the basis of the already existing differently coloured asphalt surfaces on the ground of the fenced-in no-man’s-land, situated between multi-lane transit routes, as if they were cartographic elements. 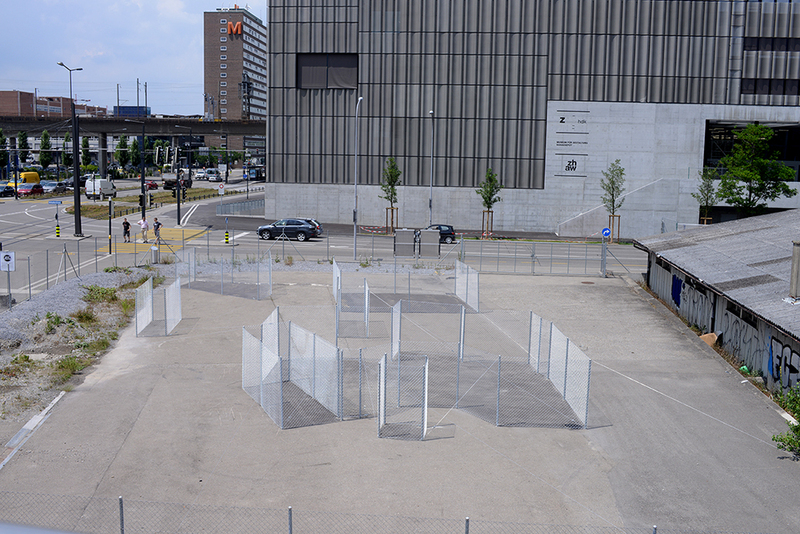 The previously installed fence that surrounds the wasteland is used within the work as a precept for the selection of materials in the intervention. Thus, within the already fenced-in area, several new fences appear, which in principle do nothing other than to delimit, and supposedly protect, an empty space. The project addresses the rapidly changing urban space, while encompassing a clear political component.